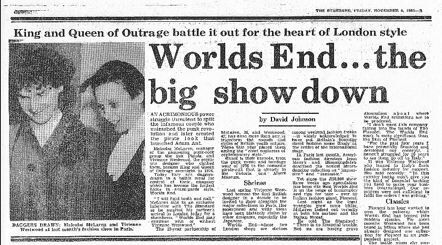 ◼ 1983 PROVED TUMULTUOUS for British youth culture. 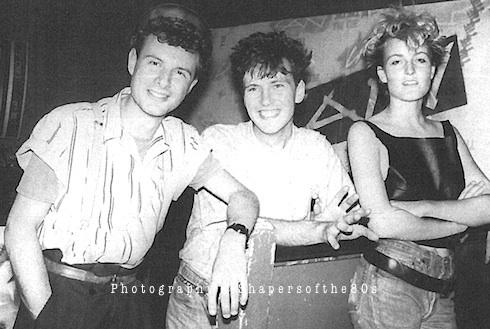 By December, London’s leading club deejay Jay Strongman declared “This was the year of Go For It”, after 17 new British pop groups lorded it in the US top 40 chart that autumn, while our spirited fashionistas were making waves around the world, with Princess Diana playing ambassador for the classic designers, and Boy George pushing the wilder extremes of street style. 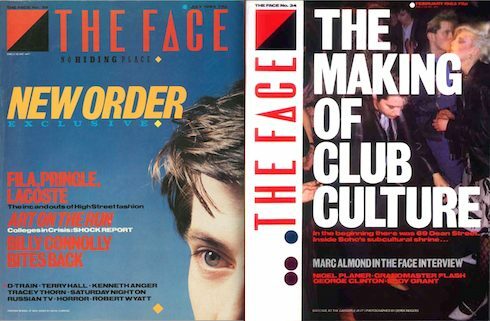 Among major features I wrote for The Face was February’s cover story The Making of Club Culture, and in the Evening Standard Posing with a purpose at the Camden Palace, a centre spread on the runaway megaclub hosted by Strange and Egan. Nightlife was a burgeoning story as black beats took over dancefloors everywhere and Manchester’s tearaway megaclub was the Hacienda, despite the oppressive clean-up being imposed by the city’s infamous Chief Constable. 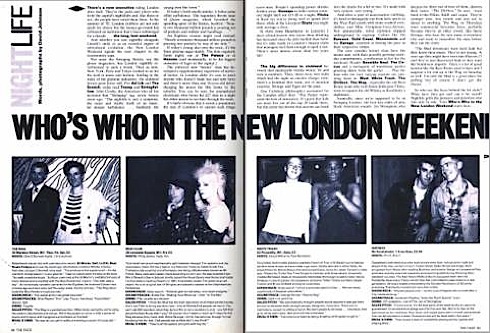 Clubbers from across the nation swarmed in to create a grand coalition of all the cults – “your complete i-D line-up, minus the Worlds End spendthrifts”. 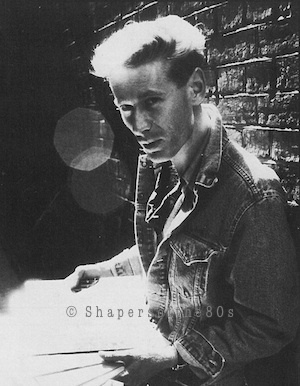 In my January report for The Face one inmate bemoaned Hacienda music as “too funk-based” though another, a flat-top lad called Johnny Maher, revealed his secret, despite having launched some new indie rock band minutes earlier. “I schlepp to funk,” he said. 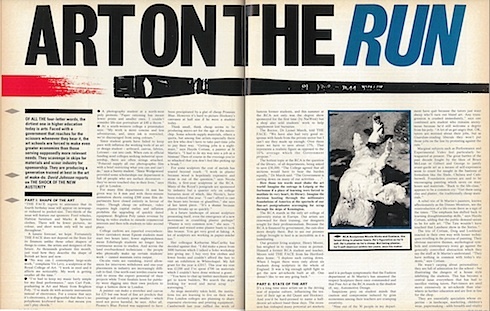 In July The Face published a major piece of reportage, Art on the Run, prompted by numerous friends in fine-art education, and billed it as a “shock report” on the Conservative government’s debilitating squeeze on the art schools. Ironically in the same issue my regular Nightlife column identified the four hottest clubland teams as a Who’s Who in the New London Weekend: “Not since the Swinging Sixties had London nightlife reverberated to such a boom.” These clubs were the unofficial job centres that kept a generation in freelance employment and introduced the verb to vop into the language (derivation: “What are you up to these days?” – “Oh, a Variety Of Projects”). Some of that effort was fuelling the rise of computer games which in the June issue Virgin assured me was “the new pop industry”! By this fertile year’s end I had FIVE indicative pieces of reportage published in the December issue of The Face including a detailed rundown on the new dance music by club deejay Jay Strongman, plus news of the imminent Westwood/ McLaren break-up which I’d scented from body language backstage at their Paris runway show. The launch of the first London Fashion Week that same October confirmed that British street style was being feted in the international spotlight, yet it begged the question how on earth had this suddenly come about? Click through to our inside page to read the feature investigation that set out to answer such questions, by asking decision-makers in the industry to identify the best of Britain’s young designer talent under the headline Eight for ’84. . .